Relatives of victims of the Utøya massacre are seething with anger at the Israeli ambassador’s insolent comparison of Jewish and Scandinavian blood. Comments by Israel’s ambassador to Sweden comparing the recently-released Palestinian prisoners to the Norwegian mass murderer Anders Behring Breivik who, on 22 July 2011, bombed government buildings in Oslo, killing 8, then killed 69 on a vacation island, have left relatives of victims of the Utøya massacre seething, Swedish news website The Local reports. In a Tuesday interview with Svergies Radio (SR), Israeli ambassador Isaac Bachman compared the release of Palestinian prisoners to setting the monster Breivik free. “The horrors that [the Palestinian prisoners] did, to put it in a Scandinavian understanding, it’s like what happened in Norway with Breivik,” Bachman told SR.
“Imagine if Breivik was released as a gesture of some sort,” he added, and complained that Israel is not getting enough credit for agreeing to the release. It turns out the good ambassador was completely wrong in his comparison, which seemed completely reasonable to him, but not to the listeners. You see, Breivik – he killed sweet, pink skinned, blond Norwegians, which was a crime against humanity, while the Palestinians only killed Jews. Big difference, apparently, in Scandinavia. The comments, which came on the eve of Israel’s Wednesday release of 26 Palestinian prisoners, sparked outrage from none other than survivors and family members of victims of Breivik’s 2011 attack, The Local reported. You see, when an entire Jewish family, babies and all, is butchered in its own kitchen – that’s freedom fighting. You have to think blond. 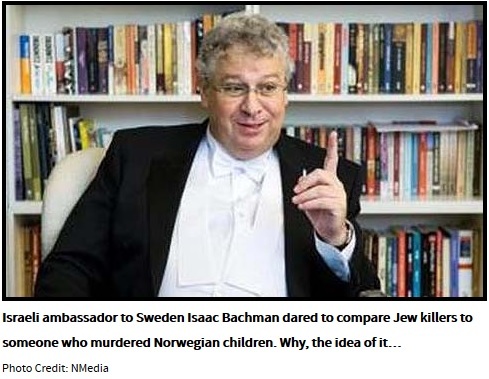 Even Middle East expert Per Jönsson with the Swedish Institute for International Affairs (Utrikespolitiska institutets – UI) slammed Bachman’s Breivik comparison. “The comparison with Brevik is insane in several ways. Breivik is very special. These people that Israel is now releasing are freedom fighters, murderers, and in some cases terrorists, but they are nevertheless rather normal people,” he told the Aftonbladet newspaper. We have to understand that the reactions from Sweden are an expression of pure, unadulterated Jew hatred, whether those people are aware of it or not. The world is changing around us, and being Jewish is no longer for the faint of heart.